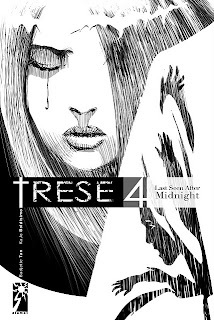 This Saturday, at the National Book Store Bestsellers branch in Robinsons Galleria, at 5:00 p.m., Budjette Tan and Kajo Baldisimo will be launching the fourth installment of their seminal komik, TRESE, which follows the exploits of Alexandra Trese and the Kambal as they fight modernized versions of the demons and creatures from old Philippine folklore. You can view the full list of cases here. As I pondered the event, I thought about how TRESE has changed the game for local Philippine komiks, and how we are now getting several that play upon local pre-Christian folklore, such as SKYWORLD and LAKAN. I wanted to see what Budjette Tan thought of this, so I sent him the following message on Facebook. Budj, here's a question for you. Whether you realize it or not, TRESE has changed the game. It is now THE komik that people point to for this generation. You've proven that black-and-white comics, printed at first on bond paper and folded in two, can have merit and quality. History will look upon this as that turning point. Even if technically better comics come out, TRESE will hold its place in history. It's like the first color TV show, or ACTION COMICS #1 (the first one), or BATMAN: THE ANIMATED SERIES. You're the one being asked by fans for cartoons, movies, video games-- you have 1258 fans on Facebook, you're the one with the book launch at National. I'm sure your sales figures bear this out too. Is any other book from the company even close? So here's my question. What do YOU think of that? Is it a turning point? Only history can say for sure. Looking back, I do think that one of the things that makes TRESE stand out is that it might be considered the first serial comics of the new decade. We released 13 cases and compiled them into 3 books. It gives the feeling that one just watched /read one season of a TV serial; as opposed to graphic novels like Elmer, Zsazsa Zaturnnah, and Mythology Class, which feel more like movies. If TRESE can make the leap to other media, I think it would be great. Looking back at the history of Superman, Batman, and Spider-Man, those characters became iconic and “ever lasting” because new readers were brought in through their TV shows, radio shows, cartoons, and movies. I’d like TRESE to find new readers that way, reach out to readers who rarely step in the bookstore, but get to lure them in because they saw it on TV or the movie theater. I think the success of TRESE also owes itself to having such a daring publisher like Visprint. So far, Visprint is the only publisher that’s taking a chance in Filipino graphic novels. Adarna tried it and stopped after a couple years. I also think TRESE became “game changing” because of it being so Pinoy. There’s actually another local graphic novel series that’s been around as long as Trese and has actually come out with five volumes. Don’t know if you’ve already read LOVE IS IN THE BAG. As far as I know, it has a pretty good fanbase and they have good sales. But maybe since it’s drawn in that manga style and not set in the Philippines, it still feel mostly manga rather than it being considered “an orginal Pinoy graphic novel”. I’m just happy that we got to finish a new book and that we’ve actually started on the next one. I’d love to see more Pinoy graphic novels on the bookshelves, whether is “serials” like Trese or one-shots like “Elmer”. I’m not so sure I answered your question! Hahaha! I believe TRESE is a turning point, and will be seen by future komikeros as a turning point. Like I said above, it's like the first color show, it's like BATMAN: THE ANIMATED SERIES, it's like Michael Jordan. Perhaps I was wrong with the ACTION COMICS #1 comparison though. TRESE is leading a renaissance, not a birth. Regardless, TRESE is history, and at 5:00 p.m. on Saturday, October 8, at Bestsellers in Robinsons Galleria, I will be there to witness and take part in history. Read my review of the first three TRESE books here. TRESE's official Web site, where you can read all of the issues on your computer, is here, and you can buy the books anywhere in the Philippines. If you don't live in the Philippines, you can order them online from National Bookstore. Join the TRESE Facebook group here.